(CHARLOTTETOWN, PE - November 26, 2018) The Prince Edward Island Potato Board has a new executive as a result of its November 21st Board of Directors meeting. Fries With The Works – PEI Classic Dish Goes High Tech! (CHARLOTTETOWN, PE – July 5, 2018) Prince Edward Island Potato farmers, through the PEI Potato Board, are proud to add their support to community events around our province this summer. Potato farmers recognize the importance of supporting the rural communities in which they live and operate their businesses in and, with their neighbours, help host world-class events that are enjoyed by Islanders and visitors alike every summer. (CHARLOTTETOWN, PE - December 5th, 2017) The Prince Edward Island Potato Board has a new executive as a result of its December 4th Board of Directors meeting. Darryl Wallace of Cascumpec was elected as the new Chairman of the Board. Darryl and his family own and operate Wallace Family Farms. Darryl represents the processing sector for the West Prince District on the Board. What does it take to grow a quality potato? (CHARLOTTETOWN, PE - October 27, 2017) The PEI Potato Industry is excited to release for the first time a thirty second commercial highlighting the industry. The farmers are so proud of what they do, and want to showcase the positive work being done in the industry and share that with our friends and neighbours here on PEI and beyond. It's Potato Harvest Time in Prince Edward Island! Toe Taps & Taters Comes to one of the Largest Potato Storages on PEI! (CHARLOTTETOWN, PE - August 31, 2017) The Toe Taps & Taters Signature Culinary Event is returning for the fifth year in a row as part of the PEI Fall Flavours month long culinary festival. This year’s event is scheduled for Friday, September 8th, beginning at 5:30 pm. A Taste of Summer: New PEI Potatoes! (Charlottetown, PEI - August 3, 2017) New potatoes have been hitting Island grocery stores, and roadside stands are popping up across Prince Edward Island. Locals and tourists alike savour this taste of Island summer. (Charlottetown, PEI - July 18, 2017) An area of increased attention for agricultural research and changes in production practices globally is soil health. Through new technology and a better understanding of the microbial communities in soil, farmers are making changes in crop rotation, tillage, and nutrient management to foster the health of their soil. Let’s Celebrate Fries with the Works! (CHARLOTTETOWN, PE - June 6, 2017) As Islanders, we know that Fries with the Works is a legendary local dish featuring PEI French Fries. However, when you talk to Islanders about Fries With The Works, or when you see them listed on a local menu, there can be many variations in ingredients! As a result, the PEI Potato Board is launching a survey to ask Islanders “just what IS Fries With The Works" to you? (CHARLOTTETOWN, PE - December 15th, 2016) The Prince Edward Island Potato Board has a new executive as a result of its December 14th Board of Directors meeting. Prince Edward Island potato growers are very happy to congratulate Fresh Media of Charlottetown, PEI on winning the award for the best agricultural social media marketing program in Canada in the last year at the Canadian Agri-Marketing Association’s Best of CAMA 2016 Awards on November 4th in Calgary, Alberta. (CHARLOTTETOWN, PE - September 22, 2016) Harvest time has arrived for Prince Edward Island potato farmers! It’s a busy and exciting time of year, when farmers put in long hours to harvest their crop after working hard throughout the growing season to nurture and protect their world famous PEI Potatoes. (Charlottetown – August 9, 2016) The Prince Edward Island Potato Board, Cavendish Farms, and the PEI Department of Agriculture and Fisheries are excited to announce the creation of the Enhanced Agronomy Initiative. This Initiative has a goal of improving marketable yields of processing potatoes and profitability of potato growers in PEI while also improving environmental sustainability of the industry. (CHARLOTTETOWN, PE - July 4, 2016) The Prince Edward Island Potato industry is proud to add its support to those affected by the devastating wild fires in Fort McMurray. A full tractor trailer load of fresh Island potatoes will be leaving PEI on Wednesday, July 6, 2016 to make the trip out west that’s been made by many Islanders and other Atlantic Canadians for decades. Potato Planting Time on PEI! (CHARLOTTETOWN, PE - May 10th, 2016) Prince Edward Island potato growers are beginning one of the busiest times of their year...planting season. Potato growers are excited to get on the land earlier than last year and plant the Island’s famous crop. Planting marks the beginning of a new season and with it renewed optimism for a healthy, productive crop. (Charlottetown, PEI – April 20, 2016) This week (April 17th to 23rd) is National Soil Conservation Week in Canada, and as potato farmers across Prince Edward Island are gearing up for spring planting, they are making soil conservation a priority on their farms. Prince Edward Island Potatoes Celebrates Potato Lovers Month with Spudtastic Sweepstakes! February is Potato Lovers Month in Canada, and Prince Edward Island potato growers are celebrating by offering consumers a chance to win a potato-packed trip to Prince Edward Island! To enter the Spudtastic Sweepstakes, consumers can visit www.spudtastic.ca. (CHARLOTTETOWN, PE - December 17th, 2015) The Prince Edward Island Potato Board has a new executive as a result of its December 16th Board of Directors meeting. Alex Docherty of Elmwood was re-elected for a second year as Chairman of the Board. Alex and his family own and operate Skyeview Farms Ltd., growing seed and tablestock potatoes. Alex also represents the seed sector for the Charlottetown District on the Board. (CHARLOTTETOWN, PE - November 10, 2015) The Prince Edward Island Potato Board is very disappointed by the decision of the Department of Agriculture and Fisheries to completely discontinue disinfection services effective December 31st, 2015. The Board was notified of this decision in a phone call late in the afternoon on Monday, November 9th. This decision puts the health of the potato industry in Prince Edward Island at risk. Agenda for the 2015 Annual General Meeting on November 20th, 2015. (CHARLOTTETOWN, PE - November 5, 2015) Following significant market research and rounds of development and consultation, the Prince Edward Island Potato Board is proud to share a new logo and new packaging designs aimed at further strengthening the Prince Edward Island Potatoes brand. (CHARLOTTETOWN, PE - November 5, 2015) The Prince Edward Island Potato Board extends congratulations to Hon. Lawrence MacAulay, MP for Cardigan, who was yesterday named the new Minister of Agriculture and Agri-Food by Prime Minister Justin Trudeau. (CHARLOTTETOWN, PE - September 22, 2015) Harvest time has arrived for Prince Edward Island potato farmers! 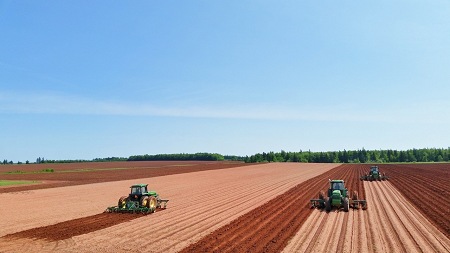 It’s a busy and exciting time of year, when farmers put in long hours to harvest their crop after working hard throughout the growing season to nurture and protect their world famous PEI Potatoes. (CHARLOTTETOWN, PE - June 29, 2015) There have been no arrests to-date in the case of food tampering involving the deliberate insertion of metal objects into potatoes. The potatoes were destined for human consumption and the local industry remains concerned about the effect cowardly acts such as this have on the confidence of consumers in the food supply. February is PEI Potato Lovers Month in Canada! (CHARLOTTETOWN, PE - February 9, 2015) It’s time to celebrate Prince Edward Island Potatoes this winter, because February is PEI Potato Lovers Month in Canada! Nutritious and tasty PEI Potatoes are available from grocery stores across Canada and can feature in all meals of the day. 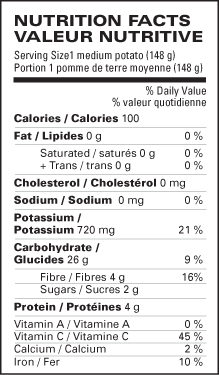 Potatoes are the most consumed vegetable in Canada, providing essential nutrients for a balanced diet. (CHARLOTTETOWN, PE - November 10th, 2014) Over the past number of years, the potato industry has been actively adopting Food Safety and Traceability Programs knowing that they are now part of doing business and to ensure our customers of a safe, quality food supply. The recent food tampering case with needles put in potatoes at Linkletter Farms has left our industry feeling shocked, and is unacceptable for ourselves and the general public. (CHARLOTTETOWN, PE - October 31st, 2014) It was a beautiful morning to harvest potatoes in Prince Edward Island today, but Hans Wilting and family of Linden Lee Farms in Meadowbank needed some extra help to get their world-famous spuds out of the ground. While some may say that digging potatoes isn’t rocket science, they called in an astronaut anyway! (Charlottetown, PEI - August 7, 2014) - The Island potato industry is reeling today from the announcement that McCain Foods will close its Borden-Carleton French fry facility as of October 31, 2014. Many Island farm families have worked hard to deliver high quality potatoes to McCain Foods over the years, and growing for McCain was a major component of their farming operations. (CHARLOTTETOWN, PE - August 7th, 2014) A number of Island potato growers and agricultural businesses alike are showing their love for Prince Edward Island Potatoes by displaying a number of round bales wrapped with signs promoting PEI Potatoes around the province this summer. PEI Potatoes sponsors “FryDays” during PEI Burger Love 2014! (CHARLOTTETOWN, PE - November 14th, 2013) The potato harvest in Prince Edward Island is complete and world-famous Prince Edward Island Potatoes are appearing on supermarket shelves and restaurant menus across Canada and the northeastern United States. Island potato growers are reporting a good crop of excellent quality potatoes this year. The Prince Edward Island Potato Board invites all growers, dealers, and industry partners to our Annual Meeting and Banquet on Friday, November 22nd, 2013 at the Delta Prince Edward in Charlottetown, PEI. Below you will find details of our agenda and speakers for the day. 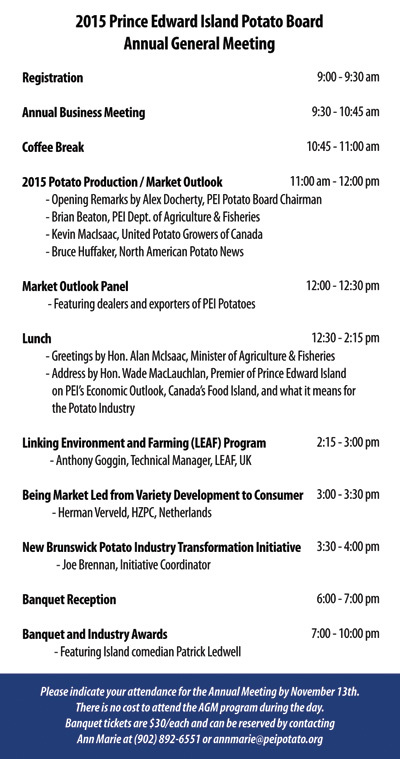 Looking Forward to an Event-Filled Fall with PEI Potatoes! Prince Edward Island has a wealth of festivals and events to experience during the summer months, and the PEI Potato Board is ably represented at many of these events by “Tate,” our mascot! Tate the Great PEI Potato travels to festivals, events, and tourist attractions across the Island each week during the summer and fall. It’s Potato Planting Time on PEI! (CHARLOTTETOWN, PE - May 9th, 2013) Prince Edward Island potato growers are in the middle of one of the busiest times of their year...planting season. Just like many home gardeners look forward to working in their gardens and anticipate the growth that spring and summer brings, so too are Island potato growers excited to get on the land and plant the Island’s famous crop. (CHARLOTTETOWN - April 18, 2013) - With summer entertaining just around the corner, Olympic Gold Medalist Heather Moyse is urging Canadians to look beyond the traditional potato salad, and get more creative when cooking their spuds - think potato chocolate cake! Our Favourite Day is FryDay during PEI Burger Love 2013! (CHARLOTTETOWN, PE - January 30th, 2013) The Prince Edward Island Potato Board recently held a series of district meetings with Island potato growers to discuss making research a greater priority for the producer-controlled organization. Meetings held in Alberton, Summerside, Charlottetown, and Montague in mid-January featured strong attendance from growers and valuable feedback on issues affecting the PEI potato industry. (Charlottetown, PE - November 2nd, 2012) The only Prince Edward Island potatoes to enter the winners circle at the Royal Agricultural Winter Fair in Toronto this year were at the top their class! (CHARLOTTETOWN, PE - October 4, 2012) 1 potato...2 potato...92,500 potato...yes, indeed. 92,500 pounds of PEI potatoes made their way to the world’s largest potato pile-up in Prince Edward Island this week. If you thought your Thanksgiving shopping list was big, take a look at this! Prince Edward Island Potatoes are Perfect for Summer Grilling! A new action committee representing government, farmers and watershed groups has been formed to develop measures to prevent future fish kills in Prince Edward Island’s waterways, Environment, Labour and Justice Minister Janice Sherry and Agriculture and Forestry Minister George Webster said Monday. The arrival of summer means new potatoes on Prince Edward Island! Summer has arrived on Prince Edward Island and nothing says summer on the Island better than new PEI Potatoes! With advantageous growing conditions this spring, new potatoes are available earlier this year with good quality and yield reported. Why Do You Love PEI Potatoes? Consumers Speak Up! (CHARLOTTETOWN, PE - January 24th, 2012) The Prince Edward Island Potato Board has launched a series of “Tater Talk” videos featuring consumers talking about why they love PEI Potatoes. Members of the public were keen to share their reasons for buying and eating PEI Potatoes and how they choose to prepare them, as well as sharing stories about the importance of Prince Edward Island Potatoes to their family. PEI Potato Board Sponsors Food Country with Chef Michael Smith! Prince Edward Island Potato Board is proud to announce that it has partnered with Canada’s most famous chef to showcase the province’s culinary excellence in a new original online web video series, Food Country, through the Culinary Alliance of PEI.